Spies from a foreign kingdom kidnapped the heir to the throne. Our loyal knights must act quickly. Rescue the royal child. Capture the traitorous fiends. Make certain they meet the end of the Medieval Knight LARP Rapier Sword. This double-edge blade is hand painted with excellent detail. Its basket hilt features a wide guard with gracefully curved quillons. Brown wrapping upon the handle creates a startling contrast, enhancing the medieval swords beauty and elegance. Crafted from closed cell foam around a solid fiberglass core, this LARP weapon is finished with a strong latex coating. 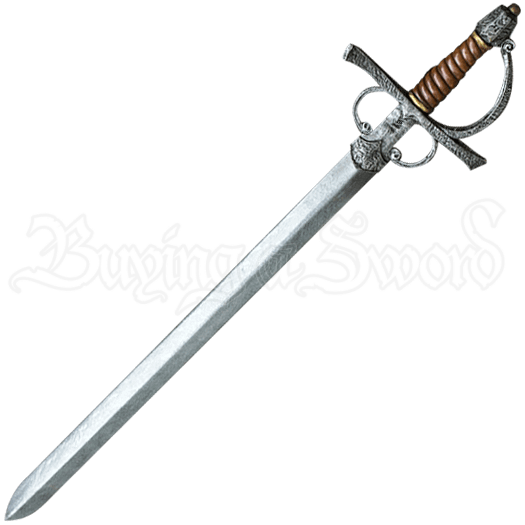 Proudly brandish this impressive sword and reveal your masterful skill at your next LARP adventure.